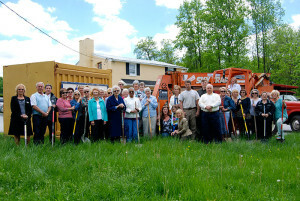 Volunteers and leaders from the Brandywine Health Foundation gathered Wednesday for a groundbreaking on an expansion of the “Little Yellow House” Brandywine Consignment Shop, which will double its size. Photo pictured left to right: Barbara Kelly, East Caln Twp. Mgr., Charles Delone and Don Ash, East Caln Twp. Supervisors, Consignment Shop Volunteers. Standing in front of tractor (left to right): Nancy Oliver, Consignment Shop Manager, Jeff Speaker of Speaker Construction, Todd Kentzel of Architectra, Lewis Larson of Larson Project Management, Margaret Rivello, Brandywine Health Foundation board member, and Consignment Shop volunteers. In tractor seat: Dale Polite, Consignment Shop Board President. DOWNINGTOWN — The Brandywine Health Foundation’s President and CEO, Frances Sheehan, along with staff and volunteers from the Brandywine Consignment Shop, broke ground on Wednesday for what will become a significant expansion for the Downingtown based consignment shop. Following the completion of this construction project, the Brandywine Consignment Shop will have doubled its shop space and parking area allowing for more quality merchandise, a higher volume of traffic and merchandise turnover, and increased profits to help support the greater Coatesville community through the work of the Brandywine Health Foundation. Otherwise known as “the Little Yellow House,” the shop has donated just under $1,000,000 to the community since 1992. “Our generous volunteers and bargain-hunting consigners and shoppers play a vital role in enabling the foundation to make generous grants to area non-profit organizations housed at the Brandywine Center in Coatesville, and we are grateful for their remarkable support.” Sheehan said. The Brandywine Center serves as a home for ChesPenn Health Services, Human Services, Inc. and Child Guidance Resource Centers which provide primary health care services, prenatal and dental care, a pharmacy, and behavioral health for residents throughout the county and beyond. It also houses 24 affordable apartments for senior citizens. While researching the expansion decision, the foundation board determined that after all forecasted sales income and expected shop costs – including consigners’ fees, at least an additional $50,000 could be donated each year to the foundation, a conservative estimate. The Consignment Shop now provides the foundation with about $50,000 annually in donations. The shop, which has been selling beautiful, like-new clothing and household items to the community for over 20 years, will reopen in the fall with increased consigning capabilities and a wider variety of merchandise. The shop employs a small staff and is run primarily by more than 100 dedicated volunteers. If you are interested in becoming a volunteer, please contact the Brandywine Health Foundation at info@BrandywineFoundation.org.